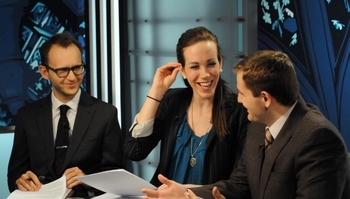 Tonight on Perspectives: How would you describe Jesus in one sentence? Does anyone have time for book clubs anymore? While the idea is quaint, I can’t tell you how many times a group of friends and I have “committed” to reading numerous must-reads only to have them turn into “should-have” reads. Throughout the past week, though, a few of my colleagues and I had the privilege of participating in a book study of our own. The tome to be treated, you ask? 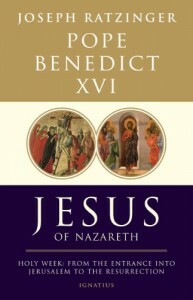 A pre-release copy of Pope Benedict's Jesus of Nazareth: Holy Week: from the Entrance into Jerusalem until the Resurrection. I must say, when S+L producer Kris Dmytrenko dropped the massive manuscript on my desk, with the word “embargoed” emblazoned across every page, I was a tad intimidated. 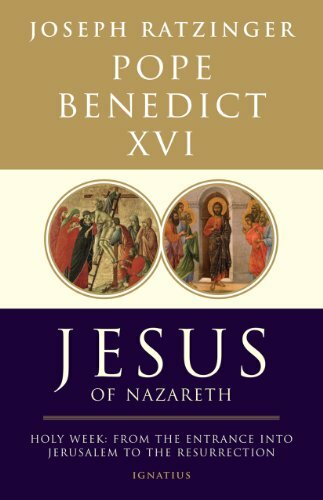 Pope Benedict XVI (or Joseph Ratzinger -- the author is credited using both names), is a man known the world-over for his incisive intellect and his ability to synthesize massive amounts of material with ease and clarity. Jesus of Nazareth is far from “light reading”. Instead, it is a textured and intimate account of a Man, The Man. When one puts the book down, is not a theme or a concept that remains with the reader -- it is a Person; it is Jesus Christ. Maria Fiore Pilon writes that Jesus is "a most intimate friend, a brother, and a God with infinite mercy and abundant love. He is the door, the way and the light for our eternal peace. Jesus is in our hearts to discover His powerful mystery. " Mary Angela Nangini writes that Jesus is "the One Who makes me an offer I can't refuse each and every moment of my life." So, who does the Holy Father say that He is? In his book, the Pope writes a multi-layered, holistic account of the last weeks of Christ’s life. He writes as a Professor, a Pastor and a Prophet, but more importantly, he writes as one who is well-acquainted with the Man Jesus. Join us -- S+L producers Kris Dmytrenko, Matthew Harrison and Jenna Murphy, along with Perspectives Weekly host Pedro Guevara Mann -- as we discuss the ins and outs of this new treasure for our Lenten Journeys: Jesus of Nazareth, Volume Two. In the meantime, you can view the book’s trailer and visit the official website. For a chance at winning a free copy of the book, go to the S+L Facebook page and answer today's question.